This week’s Brazilian Faces is Fabrício Sornas. I first met Fabrício when I attended some of the meetings promoted by the We Stand Together/Estamos Todos Juntos group last year. What I heard him say during those meetings regarding education, students’ rights, and how to better reach out to immigrant parents genuinely resonated with me. I recently discovered another project that Fabrício is passionate about: baseball, and how he plans to utilize the sport as a way to promote physical, emotional, and social wellness. How did you get to the Island? How long has it been since you moved to the United States? I moved to the U.S. 16 years ago. My wife and I came straight to the Island; we had family on Martha’s Vineyard. I am someone who is constantly thinking about the future, and how life can be even better. At the time, I was enrolled in a private college in Brazil; my major was business management, and my wife and I came with the intention to stay for two years. But as most things in life, things changed, and we ended up appreciating the tranquility and the way of life on the Island much more than we had anticipated. Have you always lived on the Island, or did you live elsewhere? In 2006, we moved to South Carolina —I love the Island, but winters in New England can be brutal. We had some friends who live in South Carolina who invited us to join them. We never actually left the Island; we would spend one week on Martha’s Vineyard, one week in South Carolina, or two weeks on the Island and two weeks in South Carolina. Ultimately, after the recession during 2008–09, we decided to stay on Martha’s Vineyard. Even though the recession had financially rocked many places in the U.S., the Island remained somewhat unaffected. What was the best piece of advice that was given to you once you moved to the U.S.? An old-timer immigrant said that if I were to establish myself and call this country home, I needed to learn English, to learn it academically so that I could send and receive work emails and speak properly as it is required in business. He said that instead of working until 8 pm, I should stop at 5 pm and apply myself to learn the language. This advice is also perhaps the only thing I would give any person who wants to live in the United States. Learning English, learning about the culture, understanding what Memorial Weekend, as well as Veterans’ Weekend, represents, is just as important as learning the language, in my opinion. This doesn’t mean that I will no longer be Brazilian, or that I am not honoring my cultural heritage. All of these elements mean that I am acquiring knowledge about my adopted country; it represents growth as a human being, and my life is infinitely better because I can speak for myself, I can say where it hurts and how people can help me. Education is the only thing no one will take away from you. Why is education something you’re so passionate about? I come from humbling beginnings. I was very fortunate that I fell in love with the sport of volleyball — encouraged by my physical education teacher while I was still in primary school. I was discovered as a player, and left home when I was 14 years old. I had to learn how to take care of myself very early on, although my parents gave me a strong moral foundation. There was much I had to learn, including the realization that I was receiving a quality education because of the scholarships I had due to my ability to play volleyball. Unfortunately, in Brazil, that is not every child’s reality; public education doesn’t necessarily offer every kid a promising future. Have you ever had to deal with discrimination? Well, because I left home so young, I had to acquire a tough skin. I am not saying that I have never experienced discrimination, but the Island is by far one of the most, if not the most, welcoming places for an immigrant. I have friends all over the country who have confirmed that indeed I am correct. But again, if you are going to move out of your home country and try the luck in a different land, you must pay attention to the well-established immigrants in the area who have lived in that place for a long time, and mirror their behavior, their way of life. These immigrants have lasted as long as they have and continue to thrive because they have made an effort to integrate themselves. I believe that if there’s rejection, it’s because there is the perception that there isn’t enough integration. I don’t believe in the Brazilian community or the American community, I think of our Island as one community — the Martha’s Vineyard community. 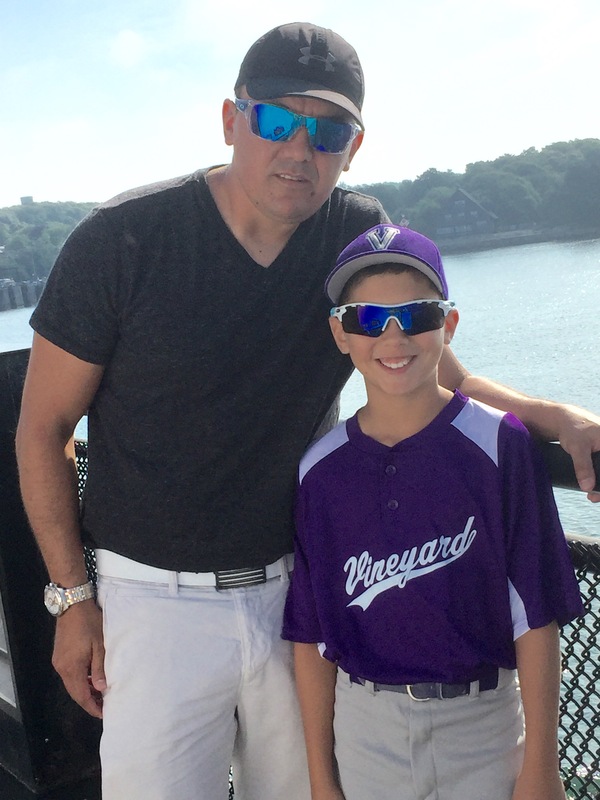 How did you get involved with the Martha’s Vineyard Little League? My son Brian at around 5 years old started to really appreciate baseball, and I supported his interest and gave him the platform to excel, and now I am promoting baseball as another sport that Brazilian kids should give a try. Again, I believe that sports save people; a kid who is playing sports will likely not use drugs because he will be invested in his body and won’t want to lose his skills and opportunities to succeed as a player. 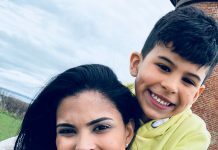 How can Brazilian parents get their kids involved? Parents can register online at mvlittleleague.org. AA, AAA, and Major League tryouts as well as evaluation will be held at the Martha’s Vineyard Regional High School, and will be split in age groups. Come join us this Sunday, March 25, from 9:30 am to 12:30 pm. There will be a translator available to help. This opportunity is open for boys and girls, and we are excited to have you join us for the 2018 season. O Brazilian Faces desta semana é o Fabrício Sornas. Eu conheci o Fabrício quando participei de algumas das reuniões promovidas pelo grupo We Stand Together/Estamos Todos Juntos no ano passado. O que eu o ouvi dizer durante essas reuniões sobre educação, direitos dos alunos e como melhor integrar os pais imigrantes da ilha na educação americana realmente ressoou em mim. Recentemente, descobri outro projeto pelo qual o Fabrício é apaixonado: o beisebol e como ele pretende utilizar o esporte como uma forma de promover o bem-estar físico, emocional e social. Como você chegou à ilha? Faz quanto tempo que você se mudou para os Estados Unidos? Eu me mudei para os EUA há 16 anos. Minha esposa e eu viemos direto para à ilha; nós tínhamos família que residia em Martha’s Vineyard. Eu sou alguém que está constantemente pensando sobre o futuro e como a vida pode ser ainda melhor. Na época, eu estava matriculado em uma faculdade particular no Brasil; cursava administração de negócios, e minha esposa e eu viemos com a intenção de ficar por dois anos. Mas como a maioria das coisas na vida, as coisas mudaram, e acabamos apreciando a tranquilidade e o modo de vida na Ilha muito mais do que havíamos antecipado. Você sempre morou na ilha ou morou em outro lugar? Em 2006, nos mudamos para a Carolina do Sul – eu amo à ilha, mas os invernos na Nova Inglaterra podem ser brutais. Nós tínhamos alguns amigos que moravam na Carolina do Sul que nos convidaram para se juntar a eles. Na verdade, nunca saímos da ilha; passávamos uma semana em Martha’s Vineyard, uma semana na Carolina do Sul, ou duas semanas na ilha e duas semanas na Carolina do Sul. Após a recessão em 2008-2009, decidimos ficar em Martha’s Vineyard. Embora a recessão tenha afetado financeiramente muitos lugares nos EUA, à Ilha permaneceu pouco afetada. Qual foi o melhor conselho dado a você quando se mudou para os EUA? Um imigrante que mora há muitos anos nos Estados Unidos me disse que, se eu quisesse me estabelecer neste país assim como adotar os Estados Unidos como a minha nova casa que eu precisava aprender inglês, aprendê-lo academicamente para poder enviar e receber e-mails de trabalho e falar corretamente, conforme necessário nos negócios. Ele disse que, em vez de trabalhar até as oito da noite, eu deveria parar às cinco da tarde e me esforçar para aprender a língua. Este conselho talvez seja a única coisa que eu diria a qualquer pessoa que queira morar nos Estados Unidos. Aprender inglês, aprender sobre a cultura, entender o que o Memorial Weekend, assim como o Veterans’ Weekend, representa, é tão importante quanto aprender o idioma, na minha opinião. Isso não significa que eu não serei mais brasileiro ou que não esteja honrando minha herança cultural. Todos esses elementos significam que estou adquirindo conhecimento sobre meu país adotivo; representa o crescimento como ser humano, e a minha vida é infinitamente melhor porque posso falar por mim mesmo, posso dizer onde dói e como as pessoas podem me ajudar. A educação, conhecimento adquirido é algo que ninguém vai tirar de você. Por que a educação é algo que é tão importante para você? Eu venho de um lar humilde. 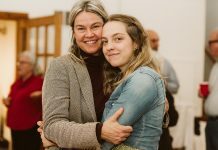 Fiquei muito feliz por ter me interessado pelo esporte do vôlei – incentivado pela minha professora de educação física enquanto ainda estava na escola primária. Fui descoberto como jogador e saí de casa quando ainda tinha 14 anos. Tive que aprender a cuidar de mim mesmo desde o início, embora meus pais tenham me dado uma forte base moral. Havia muito a aprender, inclusive a percepção de que recebia uma educação de qualidade por causa das bolsas de estudo que eu tinha devido à minha capacidade de jogar vôlei. Infelizmente, no Brasil, essa não é a realidade de toda criança; a educação pública não oferece necessariamente a todas as crianças um futuro promissor. Você já teve que lidar com discriminação? Bem, porque saí de casa tão jovem, tive que adquirir uma casca dura. Não estou dizendo que nunca me senti discriminado, mas à ilha é de longe um dos lugares mais acolhedores para um imigrante, se não o mais acolhedor de todos. Tenho amigos em todos os estados do país que confirmaram que estou de fato correto. Mas, novamente, se você vai sair do seu país de origem e tentar a sorte em uma terra diferente, você deve prestar atenção nos imigrantes bem estabelecidos na área que vivem naquele lugar há muito tempo, e se espelhar no comportamento dos mesmos, assim como seu modo de vida. Esses imigrantes duraram tanto tempo quanto eles duram e continuam a prosperar porque se esforçaram para se integrar. Acredito que, se houver rejeição, é porque existe a percepção de que não há integração suficiente. Eu não acredito na comunidade brasileira ou na comunidade americana, penso em nossa ilha como uma comunidade – a comunidade de Martha’s Vineyard. Como você se envolveu com a Little League de Martha’s Vineyard? Meu filho Brian, com cerca de 5 anos de idade, começou a gostar do beisebol, e eu apoiei seu interesse e dei a ele a plataforma para ele ir em frente, e agora estou promovendo o beisebol como outro esporte que as crianças brasileiras deveriam experimentar. Mais uma vez, acredito que os esportes salvam as pessoas; uma criança que pratica esportes provavelmente não usará drogas porque ela estará preocupada em investir em seu corpo e não vai querer perder suas habilidades e oportunidades para ter sucesso como jogador/a. Como que os pais brasileiros podem cadastrar seus filhos? Os pais podem se inscrever online no mvlittleleague.org Testes para AA, AAA e Major League, bem como avaliação, serão realizados na escola de ensino médio de Martha’s Vineyard (MV High School) e serão divididos em grupos por faixa etária. Venha se juntar a nós neste domingo, 25 de março, das 9h30 da manhã ao 12h30 da tarde. Haverá um tradutor disponível para ajudar os pais que precisem. Esta oportunidade está aberta para meninos e meninas, e ficaremos felizes em ter você se juntar a nós para a temporada de 2018.